Irish Record 37lb taken on 10.10.2005 by Paul Tennant at Cobh. Blonde Ray are typically diamond shaped, with a short tail and pointed snout. The under-side is white and the top side tan or sand coloured to blend in perfectly with its habitat. Its back is covered in small dark spots and larger, lighter coloured spots that continue to the wing extremities (useful when distinguishing from a spotted Ray). Male fish have large “claspers” below the tail and a row of intermittent spines along the back; females have no claspers and a constant row of spines along the backbone. 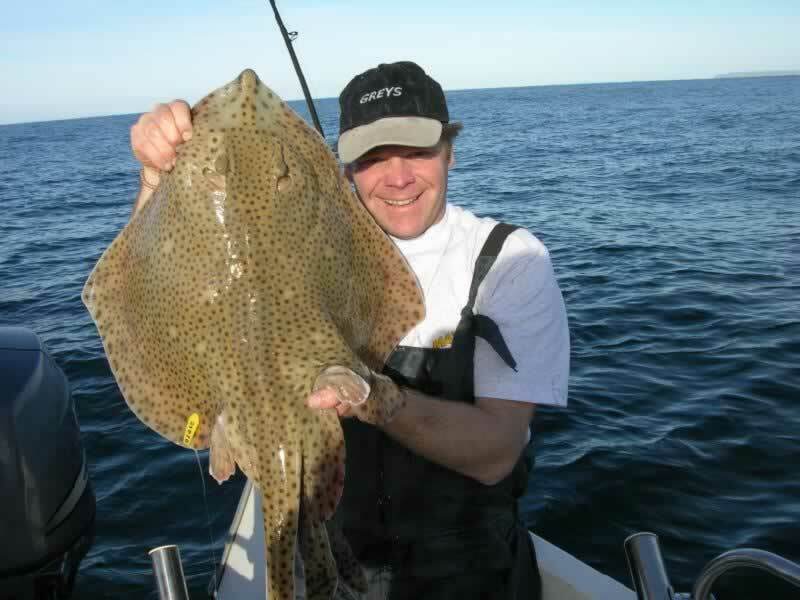 Blonde Ray can show up on most of our off-shore sand banks around the entire Irish coast but are, as usual, prominent around the south and south-west coastal venues, although the Antrim Coast will produce good catches throughout the summer months. Marks out of Portrush, Dunseverick, Ballycastle and Red Bay can be well worth trying during early summer. This species is without doubt easier to find from a boat as it tends to prefer deeper offshore sandbanks, with moderate tidal races, but shore caught specimens appear from time to time, most notably in Cork Harbour. There are sand bars and channels here towards the narrow entrance and headland known as Roche's Point where small boats anchor for blonde Ray. The shore angler is able to hit some of these fish-holding marks and can produce some superb fish. Bellmullet on the West coast in Co. Mayo has produced some fine Blonde Ray catches over the years. Further North towards Downings, notably Mulroy Bay, has given up quite a few Ray, but usually smaller, around four or five pound. Blonde Ray as with most other Rays tend to show up from late spring-early summer and continue through to late autumn. There can be some excellent winter ray fishing in Cork harbour. As Blonde Ray are basically fish eaters; many are caught on Mackerel, either in a strip, a fillet or a flapper. Whole Sand eel and Launce will work, but I find that or one or two whole calamari squid can be deadly on most occasions. When shore angling, a simple clipped down paternoster suitable for distance casting is recommended, with standard beach gear. From a boat, a flowing trace comprising of approximately twelve to fifteen feet of nylon attached to an anti-tangle boom is favourite, with hook sizes 4/0 or 6/0 depending on the size of the bait used. I prefer fishing a Pennell rig when targeting any rays. A 20lb class rod will handle any Blonde Ray, but as with the other rays listed, thought must be given to factors such as size of lead weight that is required to hold on the sea bed in the tidal flow, depth of water and other, larger species that may be present.